View of “The Nature of Arp,” 2018. 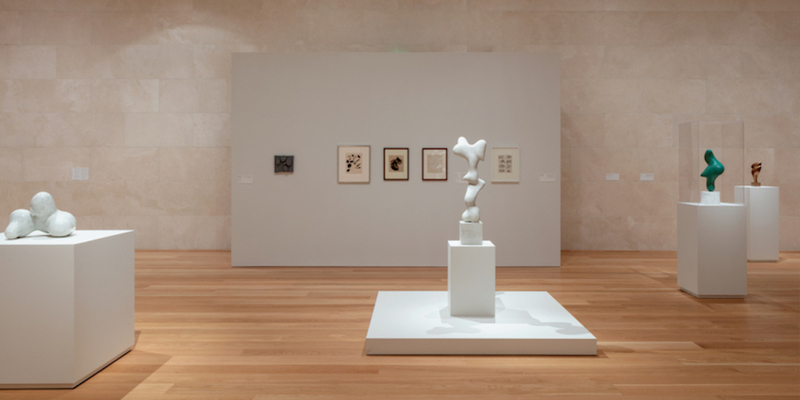 “I was born in nature,” stated Jean Arp, the master of sinuous form. In this declaration, he identified the natural world as something outside the compromises of human culture. For Arp, that which is natural contains only the essential, with form and function uniquely suited to each other. Adhering to this philosophical principle, the artist created objects that convey what feels like an inevitable sense of wholeness, while paradoxically comprised mostly of combined “fluid ovals.” This exhibition presents Arp’s fondness for minimalist, reductive forms through a selection of graphic collages, puzzle-shaped constructions, and sleek sculptures from the 1930s through the 1960s. Seen together, the works demonstrate a spirited attention to shape, clarity, and frankness of tone. In his simple black icons made for the fifth issue of Kurt Schwitters’s journal Merz in 1923, Arp seems to presage the pictogramsemoticons, wayfinding designof the contemporary world. The thick, almost crude construction of the wood sculptures, such as Horse-Bird, 1916, evokes children’s toys made with an adult cleverness; they present a stark contrast to the lithe elegance found in the dolphin-smooth surfaces of Gnome Form, 1949, which appears insular and adamantine. The suggestive anthropomorphism underpinning the rounded shapes grounds Arp’s art in a specificity that is playful and partially familiar. Arp sought to circumvent reason and our typical recognitions while unleashing what he called the “elementary and spontaneous.” While not completely free of the barbaric world he and his fellow Dadaists detested, his was a distinct drive toward a vaguely utopian art of lightness, joy, and humor.